Andretti Autosport driver Ryan Hunter-Reay explains why he hasn’t had much of an opportunity to unwind from the Verizon IndyCar Series season in a recent chat with IndyCar.com’s Phillip B. Wilson. Wilson: When the season ends, what’s the easiest way to decompress? 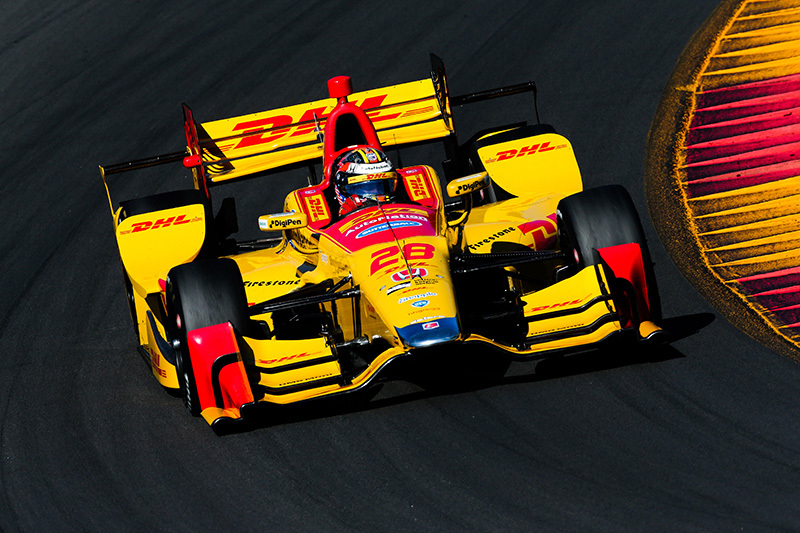 Hunter-Reay: There hasn’t been any decompression. We have a (new baby) now. We have three boys under the age of 4. It’s a bit chaotic right now, as expected. I guess we knew what we were getting into. Everybody asks, “Offseason, what are you doing with your down time?” I feel like I’ve been traveling more and been busier since the season ended than what it was during. I’ve just been non-stop. We’ve been developing, testing, sponsor appearances, this, that and the other. And then obviously the kids at home are keeping me absolutely saturated with obligations. It’s a lot of fun, though. It’s a great time. These are the times I will remember as the best. I’ve got to enjoy it every bit of the way even though it’s so busy. Wilson: You’re a water sports guy? Wilson: If I gave you an ideal day, what would take you away? Hunter-Reay: I’d run miles off shore in the boat and go spearfishing. Wilson: Anything in particular you’re looking for? Hunter-Reay: Yeah, mahi mahi and wahoo. That would be my ideal day. And to give you an idea, I haven’t done that in months, six months maybe. I’ve just been too busy. Wilson: You’re thinking about it. Hunter-Reay: Oh, I’d love to, as soon as I get a chance, I will. I can’t really leave (wife) Beccy at home with a newborn and the (other kids). It’s a crazy time right now. Wilson: Is there an ultimate vacation destination where you’d like to go? Hunter-Reay: You know where I’m going to spend my birthday (Dec. 17)? Disney World. That’s my life now. When we were running away from the (October) hurricane in Florida, we actually stopped by Disney World real quick and the kids freaked out. They had the character breakfast where the kids eat with all the Disney characters. I’m not cool anymore. The characters are cool. The kids loved it. Wilson: I had this idea of all this cool stuff you do, and here you’re taking your kids to Disney World? Hunter-Reay: Yeah, if you can imagine, we packed up in the motorhome to avoid the hurricane and we spent a week on the road with three kids under the age of 3 and a half, five (people) in the motorhome. Wow! I have some gray hairs from it, but it was good fun. Hunter-Reay will be getting away Dec. 1-4 to host his second annual “Race to Beat Cancer” driving and golf experience in Monterey, Calif., to benefit his Racing For Cancer charity. Hunter-Reay and James Hinchcliffe, the Schmidt Peterson Motorsports driver who just finished runner-up on “Dancing with the Stars,” will participate and serve as racing instructors for the Skip Barber Racing School portion of the event at Mazda Raceway Laguna Seca. Attendees also have an option to play a round of golf at the famous Pebble Beach Golf Links. Exclusive dinners and receptions are included as well as reduced room rates at The Inn at Spanish Bay. For more information or to reserve a spot, click here or email Tom@RacingForCancer.org.